The Knitts are a tightly-woven band of three brothers and two of their childhood buds. Their music, oscillating between genres like garage-rock and post-punk, with influences from Blur to Sabbath and beyond, is less close-knit, but just as wonderful. 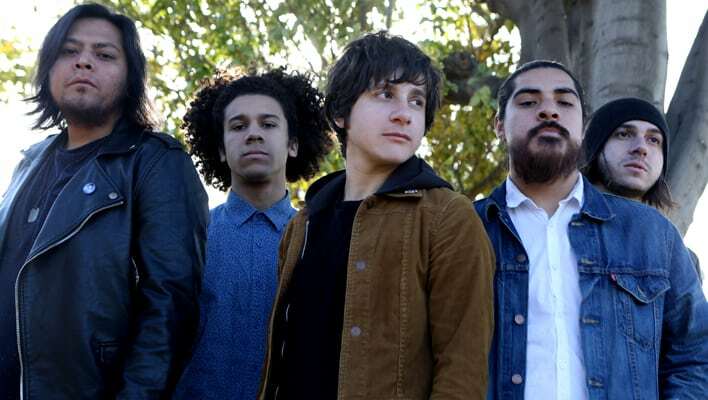 Catch them at The Hi Hat in Los Angeles on Feb. 15. With a new EP, Simple Folk due out this week, and a full album later in the year, The Knitts are in the midst of a magical time for any band, a metastasis where excitement and exuberant innocence are still mostly intact. This was frontman Justin Volkens’ first phone-interview, not apparent in his thoughtful answers, but in his easy laugh, palpable passion for all things music, and a doting love for his band. It’s this essence The Knitts wanted to capture on record before they lose it. “The album is mostly songs we wrote about four or five years ago. We have at least enough material to fill four records, but this is the one we really want out. I think you have to maintain an adolescence. That learning curve. Writing music without it being a job yet. There’s an innocence to it from when nobody else was involved. Do they fit neatly in a genre-descriptive box? No. Have people asked them to change their name (which, across the Atlantic means head-lice)? Yes. At any point in the near future are they willing to kowtow to the big bad music suits? Definitely not. “We all grew up listening to ska and punk, you know that San Fernando Valley scene, but we also each come from different genres of rock music. There’s metal fans between Charlie and Brandon, Victor is really old-school 70’s rock like Zeppelin, Sabbath, so it’s a vast array where each of us sort of found our footing and we all bring different styles to the band. This musical mixed bag can make live shows an interesting dilemma, but again, Volkens looks to the greats. As far as “making it” Volkens remains charmingly optimistic, citing LA as a land of competition, but also vast opportunity. “There’s the negative part where there’s so many bands and it’s hard to get booked a certain night because there’s just no openings. But there’s also no shortage of people you could meet. You could meet anybody at any venue. “We play The Sugar Mill in Reseda all the time. That’s like a Dave Grohl hotspot and Tenacious D warms up their set over there before they go out on tour. The Knitts’ sophomore EP, Simple Folk arrives on store shelves on February 12 via Knitting Factory Records.